Ventricular Fibrillation is a type of heart rhythm disorder. The chambers of the heart that are supposed to throb, only vibrate when ventricular fibrillation occurs. This is caused by a disruption of electricity to the heart. As a result, the heart is unable to pump blood throughout the body, so the blood supply that carries oxygen and nutrients to the organs of the body will stop. This condition is an emergency condition that must be treated immediately, because it can cause death in just a few minutes. 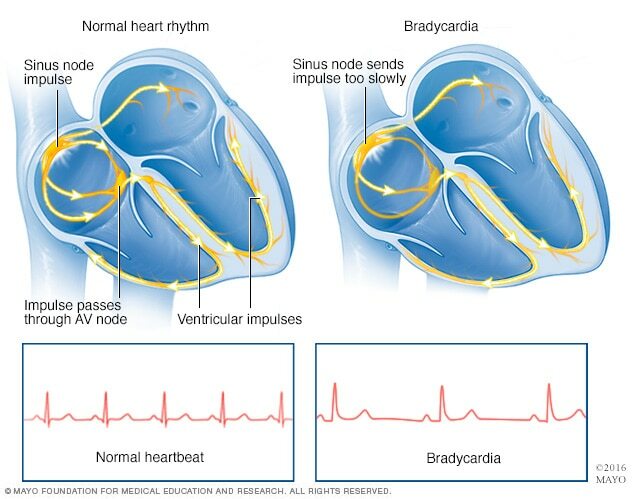 Ventricular fibrillation is most commonly found in adults aged 45-75 years and is a heart rhythm disorder that is often encountered during a heart attack. In addition, ventricular fibrillation is also the main cause of death from sudden cardiac arrest. If these symptoms appear, immediately ask for help from someone around and contact the nearest health worker for treatment. Heart muscle disease ( cardiomyopathy ). Drug abuse is a type of cocaine or methamphetamine. Disorders of the body's electrolyte balance, such as magnesium and potassium. This ventricular fibrillation will be more susceptible to people aged between 45-75 years, and has experienced previous fibrillation ventricles. Ventricular fibrillation (VF) is an emergency condition that must be detected quickly through a pulse and examination of the heart record . The pulse of patients with ventricular fibrillation will not be palpable, and the results of examination of the heart record will show abnormal electrical waves. Blood test, to check the amount of excess heart enzymes in the blood due to a heart attack. Chest radiograph , to get an idea of ​​the size of the heart and the condition of the lungs. Echocardiography , to get a picture of the heart through sound waves. Cardiac catheterization, to find out if there is a blockage in the heart arteries (coronary), by injecting a special dye through a catheter hose inserted from a blood vessel in the leg towards the heart. Images of blood vessels will be captured through X-ray photos. CT scan or MRI, to check if there are other disorders of the heart through a clearer picture of the heart. Pulmonary heart resuscitation or CPR . The CPR procedure is performed to pump the heart from the outside, namely by applying pressure from the outer wall of the chest (compression). Heart shock device (defribrillation). In developed countries, especially in public areas, an automatic heart shock device (AED) is available. When a person's heart stops, this device can be directly mounted on the chest wall to analyze the heart's electricity, and will automatically provide electric shock if necessary, to restore the heart's normal rhythm. Both of these actions really need to be studied, because they can save the lives of patients while waiting for medical help to come. Giving medicines to regulate heart rhythms. Can be a beta blocking type drug, for example bisoprolol. Attach the heart ring. This procedure is performed in cases of VF caused by a heart attack , as well as to reduce the risk of further attacks. The ring aims to open the blocked blood vessels of the heart and keep them open. Heart bypass surgery . This operation is also performed if VF is caused by coronary heart disease. In heart bypass surgery , new blood vessels will be created as an alternative pathway for blocked blood vessels. Implantation of a heart shock device (ICD). Implantable cardioverter-defibrillator (ICD) will detect heart rhythm disorders, and provide electric shock automatically to restore the heart's normal rhythm. This procedure is more effective in preventing fatal conditions due to heart rhythm disorders, compared to administering drugs. Applying a diet with balanced nutrition. Maintain ideal body weight, according to body mass index (BMI) . Regular exercise, for 30 minutes every day. 0 Response to "What Is Ventricular Fibrillation"